Betty and Robert Cawley stand in Cawley Court at Urbana University. Urbana University, a branch campus of Franklin University, announced that the Lester Baum/Cawley Court campaign has successfully reached – and surpassed – its fundraising goals. With its goals achieved, “Cawley Court” graphics have been installed and plans announced for a Saturday, March 2, formal dedication ceremony. The ceremony will take place during half-time of the men’s basketball game (5:30-6 p.m.) in Urbana University’s Grimes Gymnasium. The campaign to name the Grimes Gymnasium court “Cawley Court” was added as an extension to the existing Lester Baum alumni campaign and was made possible through the donation and support of Dave Ross (UU Class of ’76). 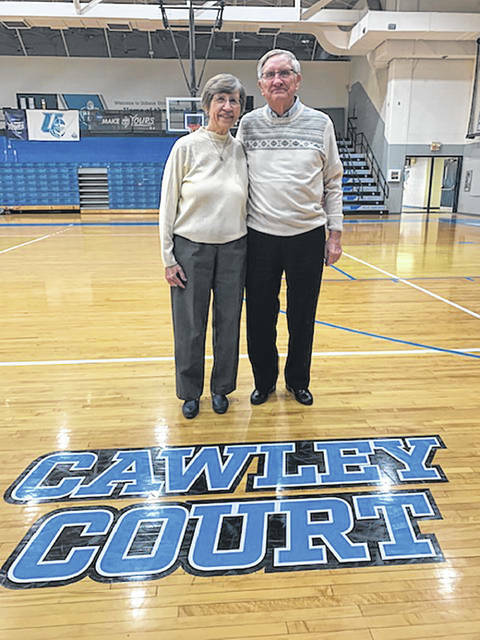 The “Cawley Court” naming rights honor former Urbana University educator, coach, administrator and 2005 Urbana University Hall of Fame inductee Robert “Bob” Cawley. Cawley spent more than three decades at Urbana University, serving in a variety of roles including athletic director, chair of the health & physical education department, head men’s basketball coach, head baseball coach and head men’s soccer coach. Under his 13-year tenure as head coach of the Urbana University men’s basketball team, he helped lead the team to a 1980-81 conference championship, earning the school’s first postseason berth. Urbana University students, faculty, staff, alumni, community and friends are invited to join in the March 2 formal dedication to help honor the Cawleys, who continue to give much to Urbana University, its students and all who know them. The Lester Baum plaque dedication ceremony will be hosted during the Urbana University football spring game on Saturday, April 27, at 6:30 p.m. in the Grimes Gymnasium.